Meatza is the quintessential picture of comfort food. Food to cuddle up on the couch to. Food that pleases everyone in the room, wherever that room may be. Food to celebrate a special occasion with. 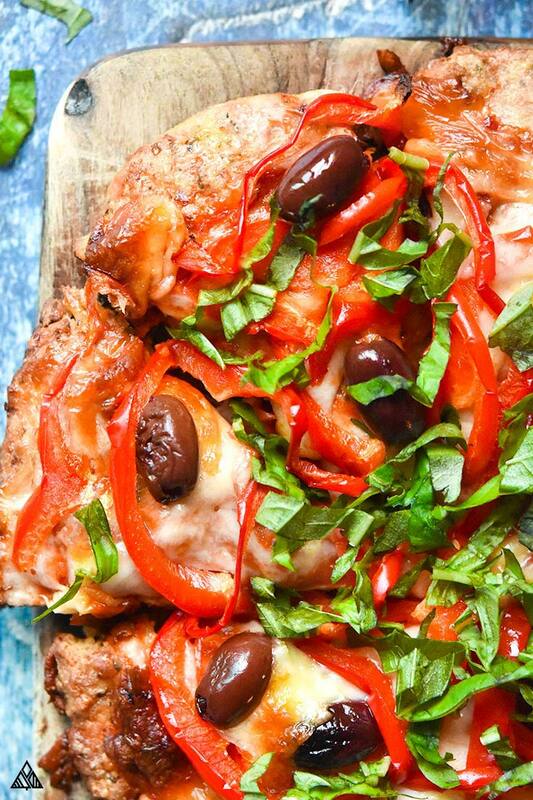 Pizza is something this low carb gal can’t live without! 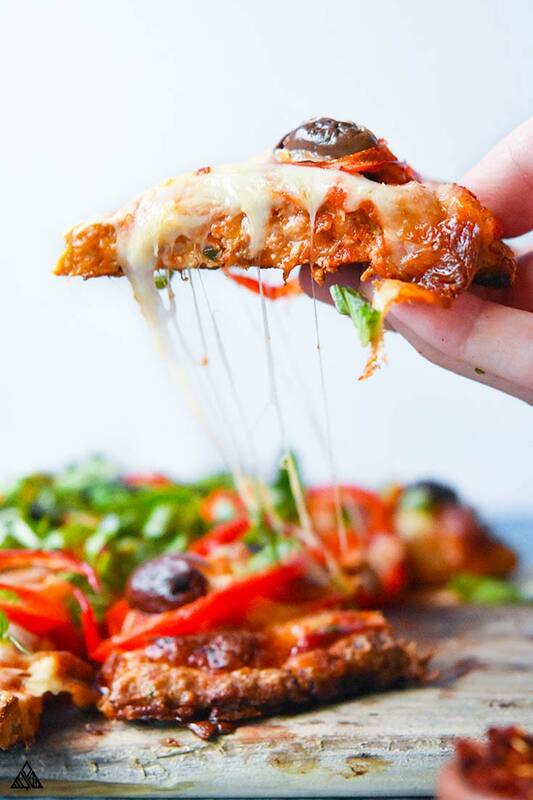 But not just any low carb pizza — a pizza that adheres to low carb foods guidelines and is as desirable as the original flour crust. After much trial and error, I couldn’t be more elated to bring you a low carb pizza that’s truly worth its salt. This meatza rises above the pack because of it’s comforting, delicious, and satiating meaty base. It’ll leave you feeling full and completely fulfilled! Preheat your oven, and prepare 2 rimmed baking sheets with parchment paper. It’s important to use rimmed baking sheets, as the meat will release liquid (grease) as it bakes — you don’t want this spilling into the bottom of your oven. Add your meatza ingredients to a large bowl and combine thoroughly using your hands (just like you would a low carb meatloaf or meatza lasagna). 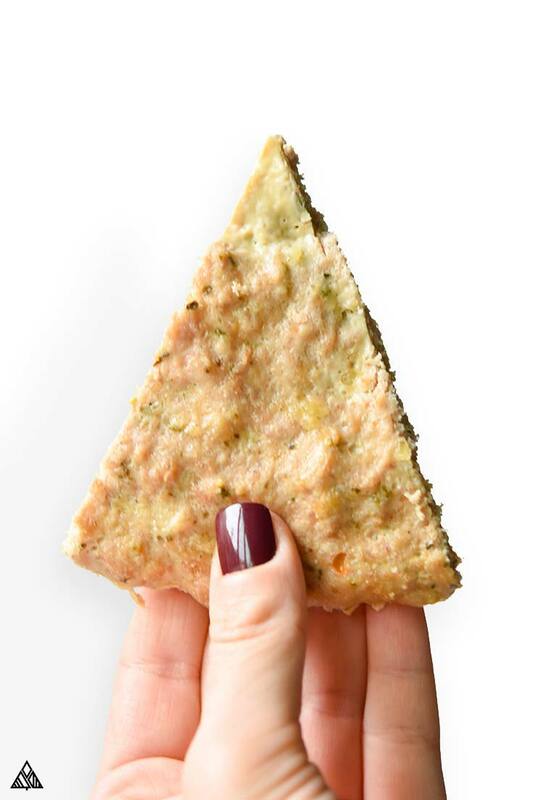 Form the meatza crust on your prepared rimmed baking sheets. I made 2 large round pizzas — feel free to form them into whatever shape you’d prefer. Press the crust until it’s ¾” thick (too thin, the meatza will overcook, too thick and this cook time won’t be long enough). Bake your meatza in the oven for 18 minutes, or until it’s cooked through entirely. Remove your pizzas from the oven and crank the heat to broil. Cover your crust with toppings (suggestions below), and toss your meatza back into the oven, until the cheese has melted and the veggies have softened. 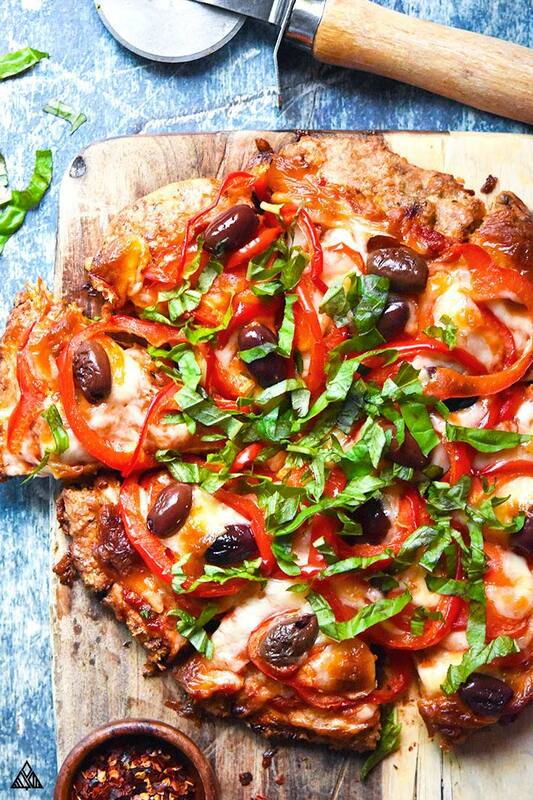 Allow the meatza to cool- then slice, serve, and enjoy! 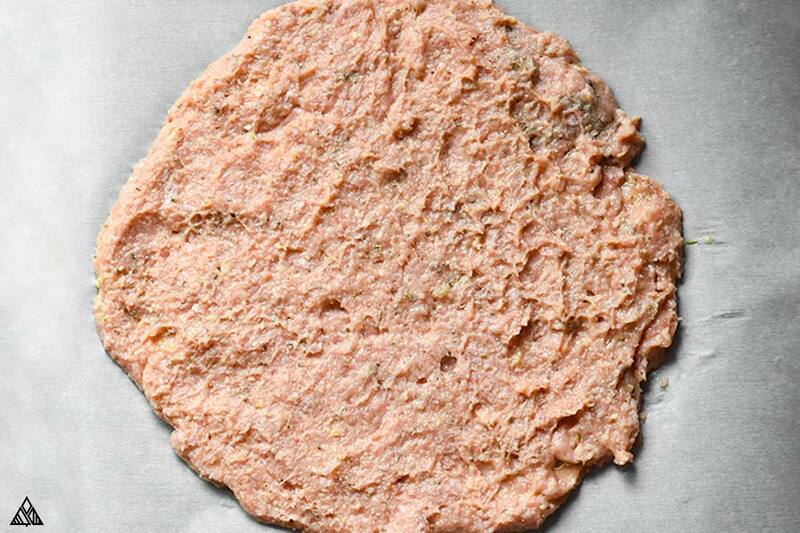 Meat — turn this into meatza keto ground beef, ground chicken recipes, even sausage substitutions would be delicious! Seasoning — leave out Italian and try adding some low carb taco seasoning, curry, or whatever you’re craving. Cheese — you can swap the parmesan cheese for cheddar or mozzarella. My favorite part about this meatza recipe is the creative component to the toppings selection. Unlike most pizza recipes, we already have meat in the crust. Which may not be a reason to skip the meat toppings for some of you — but if you’re like me, it’s cheese, sauce, and veggie time. Keep it simple by topping with fresh basil leaves and spongy mozzarella to mimic the Italian classic margherita pizza — try swapping pizza sauce with low carb pesto! 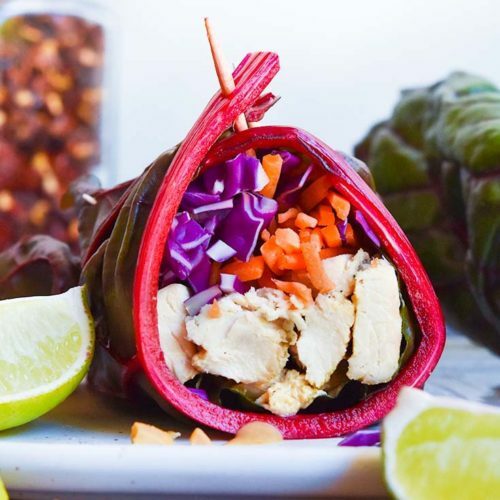 Cause a little drama at the potluck by bringing a Hawaiian version with sweet elements like pineapple (not one of the low carb fruits, but if you’re okay with it…) and red onions. The highlight of a Hawaiian, of course, is using delicious low carb bbq sauce instead of the plain ole red stuff. Use low carb Alfredo as a sauce… tastes great with mushroom, spinach and mozzarella as toppings! Keep it simple! Tomato sauce, a mix of shredded cheeses and whatever veggies you have in the fridge! Make a casserole. 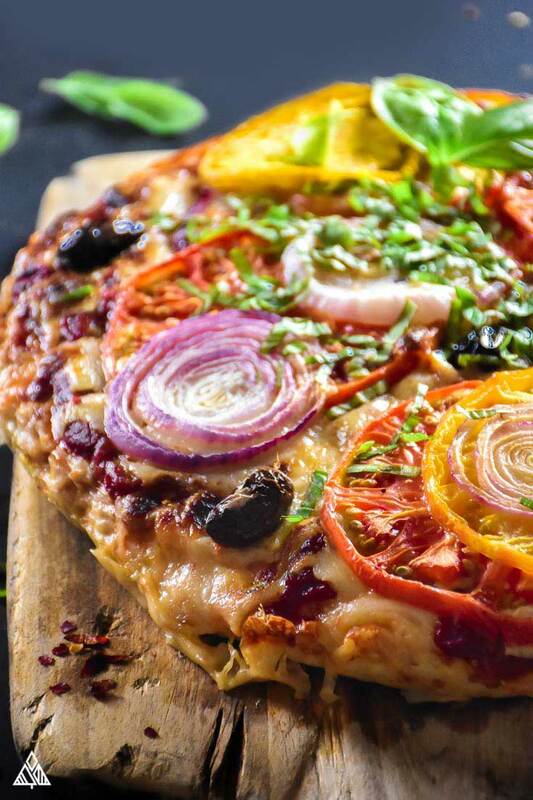 We all love the traditional hand-mouth vibe you get from holding a slice of pizza—why not try something a little less expected by creating an irresistible low carb pizza casserole with a deeper dish and handful of low carb vegetables, fresh basil, garlic, and a swirl of low carb white pizza sauce. Personalized meatzas. Let’s be real, not everyone has the same pizza topping taste… Try rolling out personal-size meatza and allowing everyone to top their creations themselves. It’s really hard to go wrong when you’re talking about meatza. However you dress it up, your family and friends are going to fall in love with this crowd-pleasing king of low carb meals! Pst, for those wondering, I haven’t yet found where to buy meatza. If you’ve been hit with the low carb blues, we've got a new tune for you to sing. 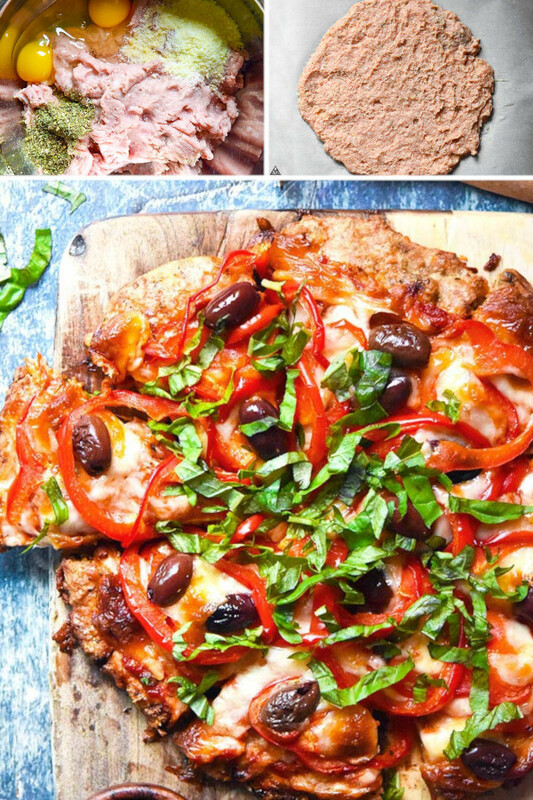 Meatza, a DELICIOUS low carb, high protein pizza. 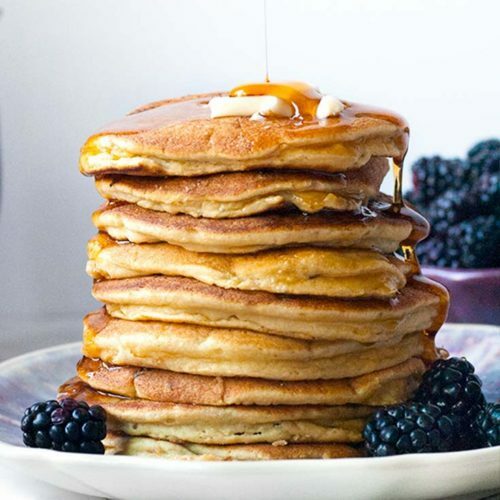 It's the stuff low carb dreams are made of! Preheat oven to 450 F and line 2 rimmed baking sheets with parchment paper. 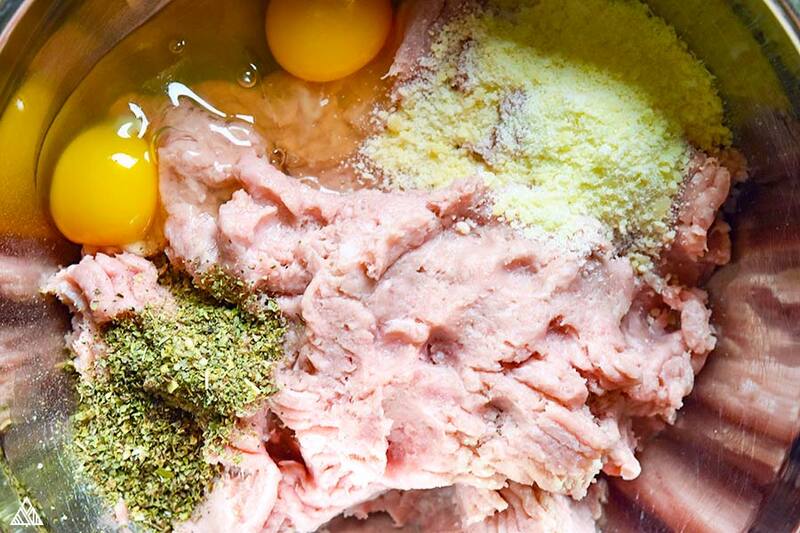 In medium bowl, mix the meat, eggs, parmesan and spices with your hands until everything is well combined. Divide the meat in half. 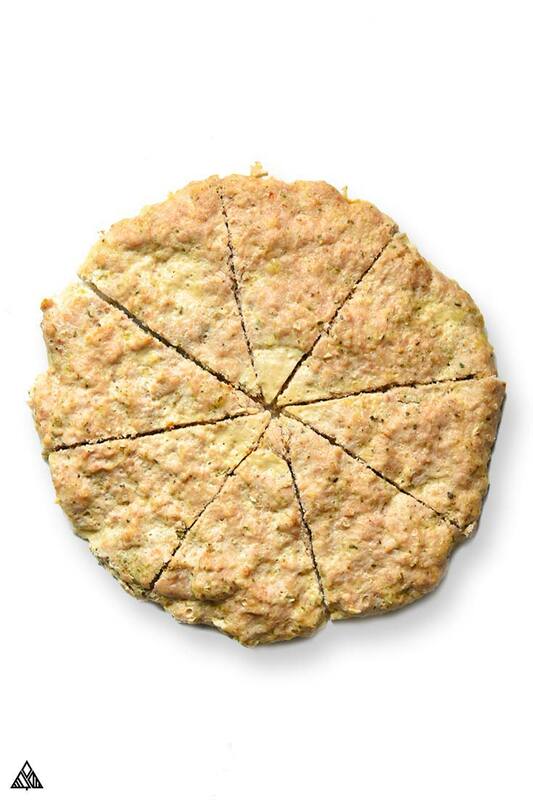 Form each half of the meat into circular shapes on your 2 prepared baking sheets, until the crust is about ¾” thick. Toss in preheated oven and cook until turkey is cooked through and no longer pink in the center – about 18 minutes (this will vary with how thick you make the crust). Once cooked, remove from the oven and crank it up to broil. Cover your crust in pizza sauce, cheese and toppings. Return to the oven and broil. Watch closely, you only want to melt/brown the cheese. Allow the pizza to cool before cutting and enjoy! Nutritional information is based on 2 slices of pizza, if you make 2 pizzas and cut each into 16 slices. Or 1 slice of pizza if you make 1 and cut it into 8 slices. Nutritional info doesn’t include toppings, sauce or cheese. For the pizza in the photos, I used: 1 cup or low carb pizza sauce, 2 cups mozzarella, ½ red bell pepper, ¼ cup artichoke hearts, ¼ cup kalamata olives, and fresh basil. Imma try this! Thanks for the recipe!! Why can’t I find all the macros in this ? What’s the fat,g. Protein,g, and carbs, g ? Whaaaa. Thanks much for this recipe! Have been on low carb a long time, just discovered your site, & recipes, and pizza has been the one thing I craved most. 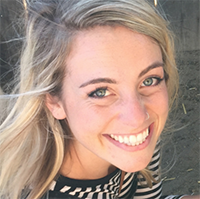 Congrats on the BEST low carb recipes I have found. Keep up the good work! Thanks for this recipe! I have been on low carb a long time, and pizza is the thing i craved most! You have many alternative ways to fix, also. 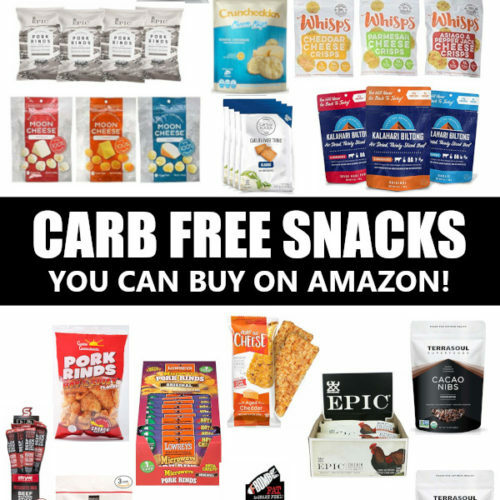 I discovered your site recently, & it is bar far the best info & recipes I have seen for l=Low Carb. Keep up the good work!